Chapelle-de-Sainte-Anne-la-Palud by GO69 (Wikimedia Commons). Latitude: 48.135994. Longitude: -4.262185. 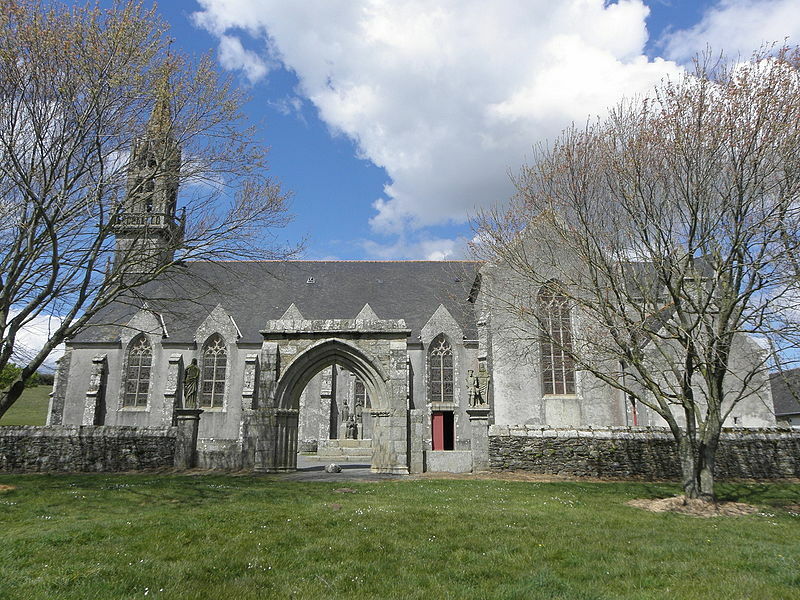 At the western side of the little Breton village of Saint-Anne-la-Palud in Plonevez Porzay, Finistere, Bretagne (Brittany), 4 miles northwest of Locronan, is the large 19th century Gothic Catholic chapel and pilgrimage centre dedicated to St Anne, mother of the Virgin Mary. The chapel (Kerk) is actually a basilica, and is located on Sainte-Anne la Palud road. There have been several chapels on this site – the first founded by St Guenole in the 6th century may have been nearer the shoreline, in the marshes. To the south of the chapel on Sainte-Anne la Palud road, is St Anne’s Fountain (Fontaine de Sainte-Anne), which has been visited for its miraculous properties for hundreds of years by the faithful from the local area and further afield. A few hundred meters to the west is the coast and beyond that the Atlantic Ocean. Legend tells us that St Anne or Ana was an Armorican (Breton) woman of noble birth who journeyed to Judea where she gave birth to her daughter, Mary. She is said to have been transported there by angels. Later, she returned to Brittany (after Jesus’ birth) and died there? But this Legend seems to be purely a Mythical one, or it was adapted from the Life of another Breton saint Anna (Ana). In Ireland the Celtic goddess Annu (Danu) of the Tuatha De Danann, seems to have metamorphosed into St Anne. Annu was celebrated in May, according to Colin Waters (2003). The first pilgrimages to Sainte-Anne la Palud may have began way back in the 5th or 6th century at the behest of the two local saints: Corentin and Guenole. Land for the building of the first chapel dedicated to St Anne was given to St Guenole by King Gradlon. The present-day chapel dates from 1864. In more recent times: from the 17th century onwards pilgrimages have become more prevalent as have the ‘pardons’ in honour of the saint which take place in the sanctuary of the chapel in late July (small pardon), culminating in the ‘Great Pardon’ on the last weekend of August, each year. Then the procession through the village begins and is always well-attended by the local community. During the ‘Great Pardon’ a painted statue of the patron saint, made of granite and dating from 1548, which is much venerated here, is held aloft and carried on its processional journey through the village from the Chapelle Ste-Anne to the 17th century Calvary and, eventually to the Fontaine de Sainte-Anne. 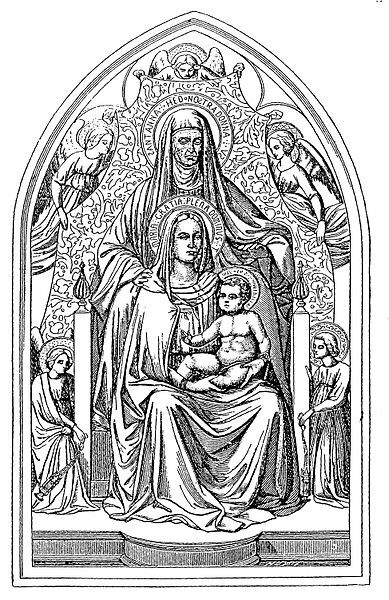 Virgin & child with St Anne by Otto Bitschnau (1883). 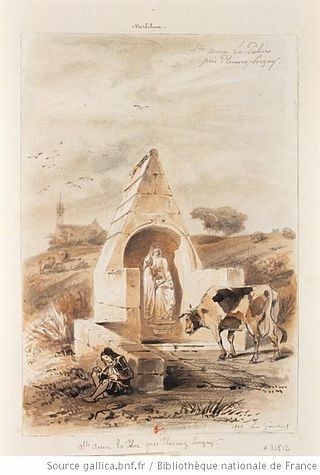 Fontaine de Saint-Anne-la-Palud by Leon Gaucherel 1844. Fontaine-de-Sainte-Anne or St Anne’s Fountain is about one-hundred metres to the south of Chapelle-Ste-Anne – at the south-side of the road, beside a wooded area. This originated as a spring of water which flowed at the bidding of Jesus, according to the Legend, when he apparently visited, with St John, his grandmother’s place of birth, or maybe she was still living when he came to visit her? The spring or well has been the site of miraculous cures down through the centuries and a place of pilgrimage for the faithful since very early times. It has been claimed that many, or all diseases, were able to be cured by the waters of the holy fountain, but rheumatism being one in particular. Madness and evil were also healed and warded off by the water. A statue of St Anne, on a plinth, with a young Mary at her side stands looking down over the well basin, the present structure of which dates from 1871. The local church pardons process here to the Fontaine-de-Sainte-Anne every year in Late July (small pardon) and the last weekend in August (the Great Pardon). Butler, Alban (Rev), The Lives of The Fathers , Martyrs And Other Principal Saints, Volume III, pages 839-40, Virtue & Company Limited, London, 1936. Clark, C. P. S., Everyman’s Book Of Saints, A. R. Mowbray & Co Ltd., London, 1919. Farmer, David Hugh, The Oxford Dictionary of Saints, Oxford University Press, 1982. Queffelec, Henri, Un Recteur De L’ile De Sein, George G. Harrap & Co. Ltd., London, 1972. Originally pub. in French Language (1945) by Éditions Stock. Waters, Colin, A Dictionary Of Saints Days, Fasts, Feasts And Festivals, Countryside Books, Newbury, Berkshire, 2003. Categories: Holy Site/Place of Pilgrimage, Holy Wells / Springs | Tags: Chapel And Fountain at Saint-Anne-La-Palud in Finistere (Bretagne) Brittany | Permalink.